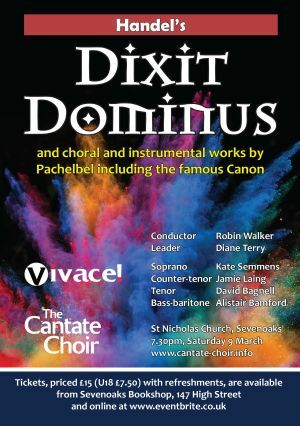 DIXIT DOMINUS AND CHORAL AND INSTRUMENTAL WORKS BY PACHELBEL – including the famous Canon. We will be performing Handel’s Dixit Dominus, a wonderfully energetic and challenging piece, together with three stately but joyful baroque choral pieces by Pachelbel. We will be joined by Vivace! who will also perform Pachelbel’s Canon in D. Our guest soloists will perform a Magnificat also by Pachelbel. Tickets cost £15 (Friends £12 and under 18s £7.50) and include refreshments. Tickets available at Sevenoaks Bookshop or by phone 0800 411 8881.